Perhaps it’s an antiquated mindset, but when I hear “Mexican,” I think of an earthy, funky flavor profile. Not the case here, proving that in the hands of a superior blender, not all smokes with Mexican content must taste like a Te-Amo. The Sabor Cubano does exhibit some earth from the start, but in proper balance. Mostly it tastes of basic, rich tobacco with hints of pepper and wood, the latter almost certainly being a product of the cedar aging. The burn and draw are outstanding. It picks up faintly sweet notes on occasion, but nothing on the scale of the average maduro. It gets a little more forceful on the final third. Earth and pepper move to the forefront on an increasingly woody base. I lay it down with an inch and a half remaining. It’s still performing well, but a touch of char has signaled the beginning of the end. 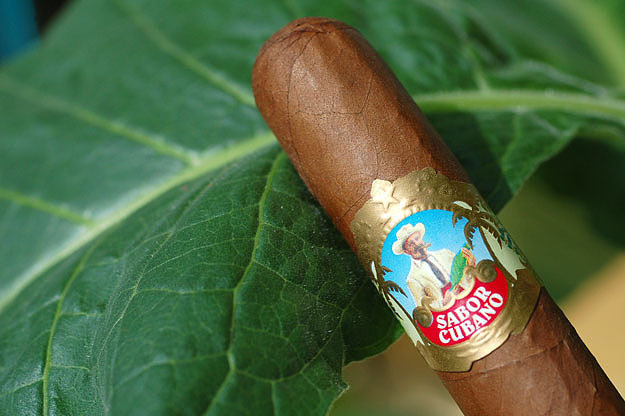 CONCLUSION: With the Sabor Cubano, Luis Sanchez once again provides superior value. The build and appearance suggest quality well beyond the $4.00 asking price. The flavor, however, falls short of Luis’ other offerings like the LTC and JML 1902. It doesn’t break any new ground, though it may cause you to rethink Mexican wrappers. All in all, it’s a solid anytime maduro — easygoing, almost creamy and without the overt sweetness that turns off some smokers.